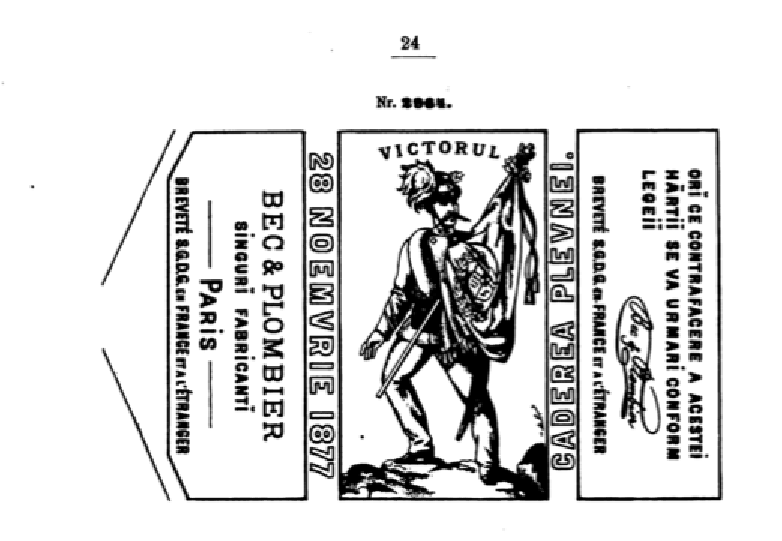 Scrolling through a very old Brand /Trademark Registry from the former Austro-Hungarian Empire, from the 1880’s, I found a very bizarre…occurrence: the brand of a cigarette paper manufacturer from Paris. What’s so special about it? A Parisian brand circulating in Vienna and throughout the Habsburg Empire, it’s not a big deal. It isn’t, indeed, but let’s analyze the following odd characteristics . It’s has even a commemorative event, highlighted on the packaging: “Caderea Plevnei” (a decisive historical battle, during the Romanian War for independence, from 1877 ). under the brand owner’s name, a Parisian firm “Bec & Plombier” and on top the location “PARIS” it is stated in old Romanian: “SINGURI FABRICANTI” which means “the only producers/manufacturers. Even the legal notice is in Romanian. During our days, you won’t find very easily an Eastern-European brand manufactured in the Far-West. The exact opposite situation is the regular norm, nowadays. The 1880’s were extremely interesting times, an era prior to the World War I and right after the Industrial Revolution. Austria-Hungary had a very “colorful” , vibrant economic landscape, with a large number of companies coming not only from it’s inner borders, but also from the Ottoman Empire, from France, from the Kingdom of Romania and of course from it’s biggest ally (during World War I ), the German Empire.